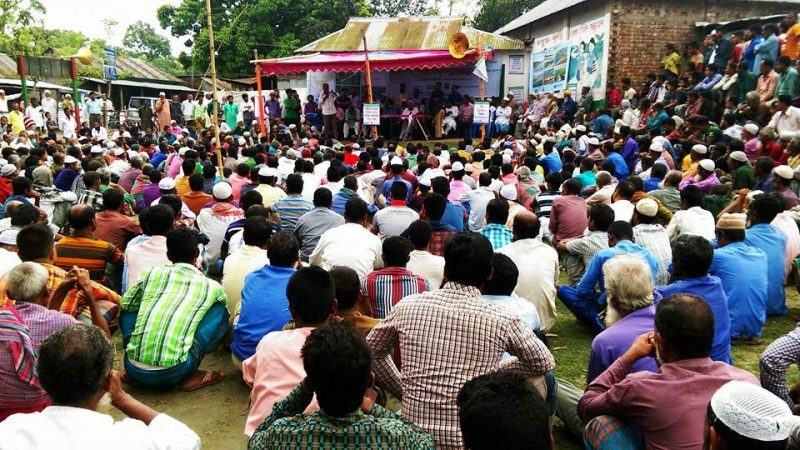 Movement to Protect the Old Brahmaputra and Its Community. Flood has always been considered as one of the major problems for the community living in Chargobindhapur, as it is located by the bank of Old Bramaputra. In past few years, floods damaged the community life at a large margin. . Last year in 2016, flood inundated crop fields and dwelling areas, washed away standing crops, houses and household, livestock and displaced the affected people. More than 120 families in Chorgobindhapur affected severely. 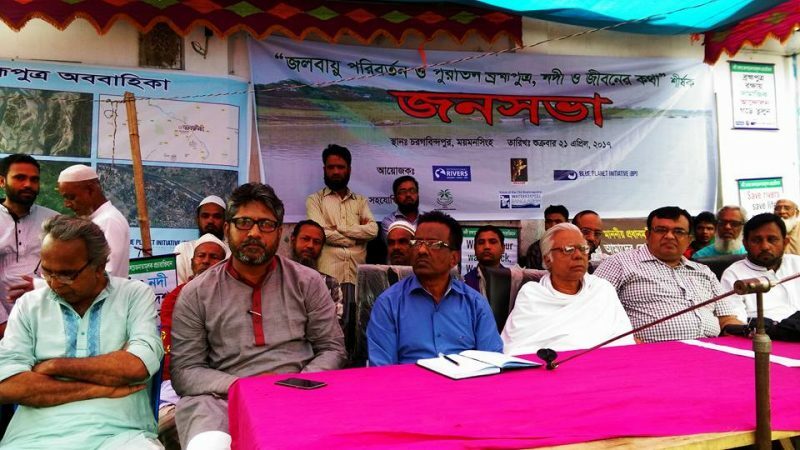 To understand the sufferings of the people of Chargobindhapur, Waterkeepers Bangladesh and together with other regional, national and local organizations arranged a community meeting. The main purpose of this community meeting was to understand how the community facing the impacts of climate change in their daily livelihoods. Due to Gazoldoba and Teesta barrage, there is hardly any water throughout the basin for the survival of the rivers themselves. Lack of water during lean period expedited the sedimentation and river changed its natural structure and capacity to carry sufficient water during monsoon. It is evident that current water projects adopted by upstream countries (India, China) such as big dams, diversions and hydro projects have not met their stated objectives but have instead created serious long-term and widespread negative ecological and social impacts on Bangladesh side. The city of Mymensingh stands by the bank of the Old Brahmaputra inside Bangladesh, and is bordered on the north by Meghalaya state of India and Garo Hills. The 1897’s Assam earthquake changed the main flow from Brahmaputra to the Jamuna River which flows west of the greater Mymensingh region. The gradual formation of chars and bars of sand in the upper part of its course (mainly influenced by The Great Assam Bengal Earthquake 1897) has diverted the main volume of water into the present channel of the Jamuna, which has in consequence become of much more importance than the Brahmaputra. Community in Chargobindhapur are mostly involved in farming land and fishing, except few of them are engaged in poultry farming which is very recent. As a floodplain, part of the Mymensingh becomes inundated in every peak monsoon. For the same hydro-geophysical hazard, however, women face flood differently than males. According to the male community, women and children are usually the most helpless and disadvantaged during flood period. Flood related deaths are often caused by drowning and snake bites, which, tend to occur in increasing numbers for children, following by adult women. Destitute women, without any employment, and compelled to migrate elsewhere, face the most acute conditions of physical and social insecurity. Poor women find it extremely difficult to ensure food and drinking water security when they struggle to live in flooded condition. . In deeply flooded areas young girls are reportedly scrounging for edible reeds and roots, while women of all ages travel long distances by boat or raft to fetch drinking water. In most cases, water sources become contaminated with pathogens. Women headed household in flood affected areas are increasing in numbers as the male counter parts leave the flooded area to a higher land for employment opportunities, and often they never come back to the family. In case of flash floods, food insecurity and sanitation are considered to be major issues for the affected women. The community people alleged to repair the flood control embankment during monsoon season. Positive mentality of the community people was displayed to overcome the adverse climate effects specially flood and erosion. The community demanded seedlings variety as the rainfall often damages crops, so high water tolerant seed should be implemented by the government and local agricultural authority. Positive mentality of the community people was displayed to overcome the adverse climate effects specially flood and erosion. Several fish species have gone locally extinct in the last 10-15 years. The community also points out that the river water gets polluted because of increased use of pesticide in the neighboring farming lands. Local farmer are more interested in using organic fertilizers in fish farming rather than chemical pesticides which have illegally incorporated by some groups of dishonest businessmen. The community further pointed out that construction of dams upstream has substantially reduced the natural flow of the river that should be taken in account. 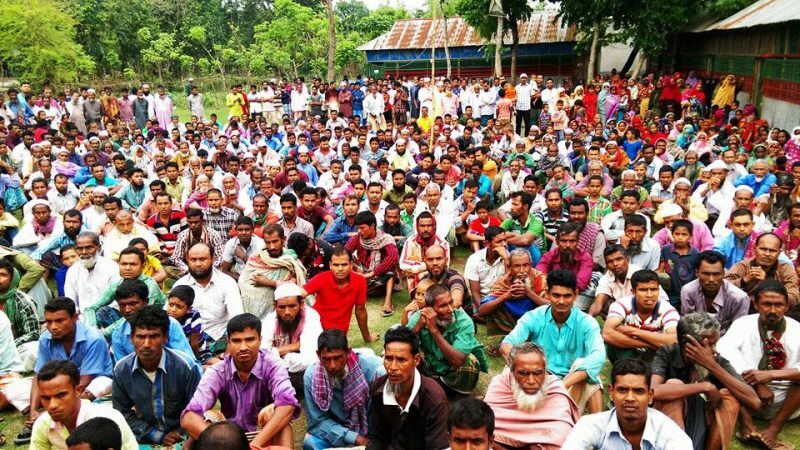 Demand to excavate the mouth of Old Brahmaputra was very loud in the meetings. Dredging and ensuring water during the winter in Old Brahmaputra sounded the obvious needs from all speakers there.